Ever noticed that just when you think life couldn’t get much better, something happens that brings you down with a thud. I (David) have just starting to settle in at work. Getting to know the ropes, getting to know all the crew and getting on well with my boss, Les, who is best mates with so many people. Never have I had a boss who so enjoys life, and the odd beer after a hard days work, and his family, and his work “family” et al. 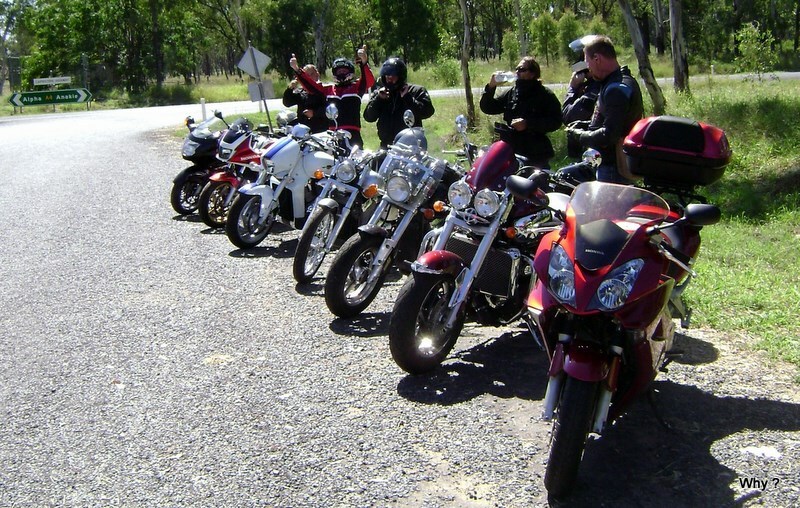 I am thoroughly enjoying my motorbike and enjoying the camaradery of the Emerald riders who came with us on rides just about every weekend. 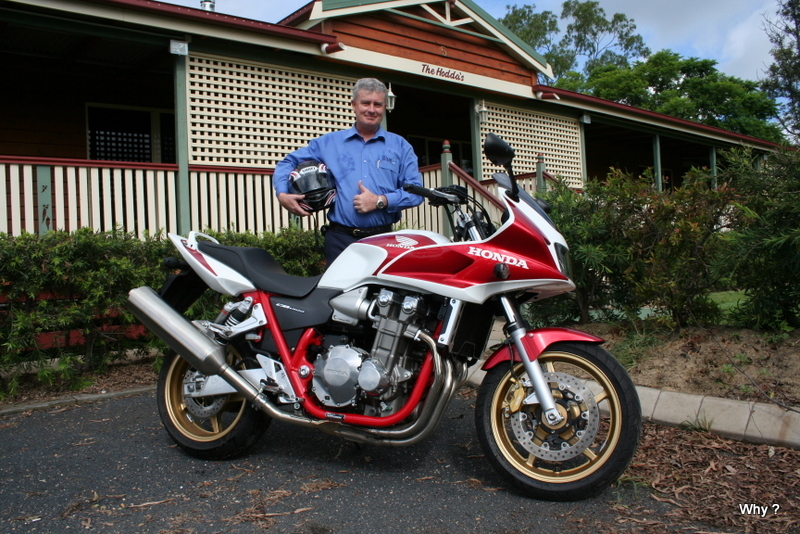 Les is chief organiser of these casual rides and is never happier than when his front driveway is full of motor bikes, as in the next photo. Les, out the front of work, just before one of our social rides. On Sunday 19 April 2008, seven of us set off. North to Capella, then south-west to Rubyvale where we met up with Jake who had his wife Mel as pillion. Terry managed to dent both his wheels on a pothole in Rubyvale, otherwise an uneventful run on a lovely Sunday morning. On to Anakie and then west to the turn-off to the Willows. The next photo was taken on the Willows turn-off. Typical Les, all smile and both thumbs up and thoroughly enjoying himself. Les, as always, enjoying the ride. Just off the highway in Willows Rd. Some twenty minutes after this photo was taken, life changed dramatically. Les came off his bike for no apparent reason. Neither speed or alcohol were an issue. Something happened to make Les sit up as he rounded a fairly tame corner. We can’t help but think that perhaps he had a heart turn. His injuries did not appear to be life threatening – a nurse driving past cared for him until the ambulance arrived. 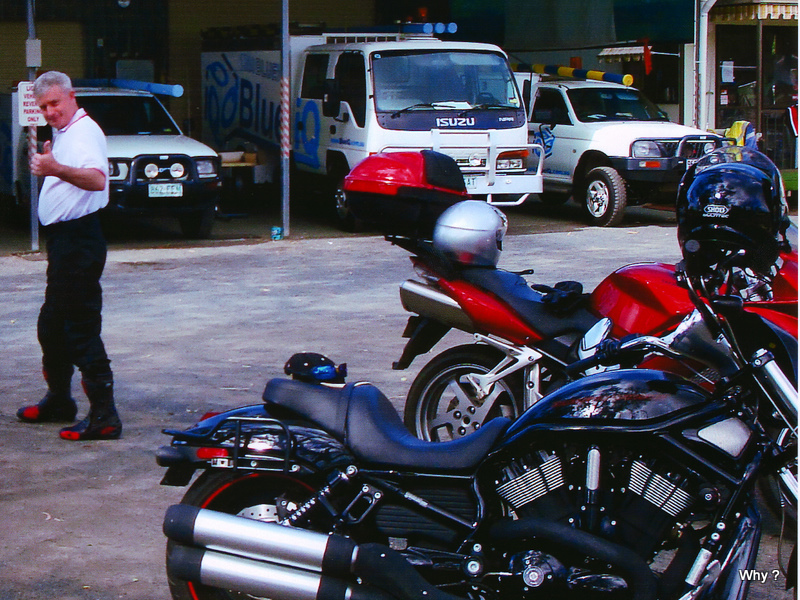 We took care of his beloved bike and then rode back to the Emerald Hospital to see how he was going. Not long after I arrived things took a massive turn for the worse. He was flown to Rockhampton but passed away on the operating table from internal injuries. The funeral was huge – something like 700 at the church, 500 at the cemetry. I am blessed to be part of Les’s “family”. His wife Debra and his four children Ashley, Laurel, Evan and Bryce has been amazing since. It was an honour to be asked to ride with the others that were there on the day, to lead the procession from his home to the church and then to carry him into the church. I can just imagine his smile if he had seen the 40+ bikes that assembled in the front yard. And I am sure he would have been the life of the party at the celebratory get-together after. I’m sure he handed me a XXXX or 2 in the arvo. Les loved the fact and reminded us often, that his surname Hodda was only a letter different to Honda. I only meet him on Jan 5th this year. I feel blessed to have know him. My and Jan’s lifes are the richer for having spent time with Les. Les will ride with me, and many others – we have a badge that says “LEZ 6509”. LEZ 65 was his number plate. My badge is on my riding jacket, just above my heart. Jan and I are off to see Carl Barron at the Capella Performing Arts Centre this Saturday and then will go further north for a couple of days. May Day holiday on Monday. Oh, one final note for you southerners – I have not worn a jumper since leaving NSW. We are both loving the autumn weather here in Central Queensland – its very similar to a south coast NSW summer.